Less “concrete,” more “jungle.” With all the hustle and bustle of urban living, it’s nice to get out and enjoy nature every once in a while. Even without a lawn or a yard to speak of, there are plenty of ways to make your home into a natural oasis in the city. This may be an easy concept to grasp for those with a green thumb, but for the rest of us, creating an urban garden can seem a daunting undertaking. From which plants to use to where to put them all, here are some tips to keep in mind when creating a beautiful garden in an urban space. Even experienced planters benefit from starting small, as different growing environments can produce different results. Once your garden setup has been tried and tested for a few months, you can slowly add more plants to the mix. If you’re worried about biting off more than you can chew, low maintenance plants still yield amazing results. Succulents like cacti and aloe don’t need constant watering and monitoring, making them a perfect way for beginners to flex their green thumbs. Bonus – they do well in close proximity to one another, meaning you can create artsy arrangements that match your style! Plant selection is key to success as a gardener in any environment, but it’s especially important when you’re operating in limited space. Your saplings won’t be small forever, so research how the plants you pick will sprawl as they grow. Ask important questions – will you eventually need a bigger pot? Will vines or fruits start to protrude into your living space? Make sure you have the space available for your plant in advance to avoid turning your loft into an overgrown jungle. Think about the goal of your urban garden and choose plants accordingly. If you want your garden to be a quiet oasis, opt for denser plants to help absorb city noise and create a luscious space for you to find your Zen. Meanwhile, aspiring master chefs may enjoy growing fresh herbs like mint and basil to add a locally grown kick to every meal. Veggies such as tomatoes and leafy greens also thrive in urban spaces, making it easy to wow dinner guests with homegrown salads. No space? No problem! 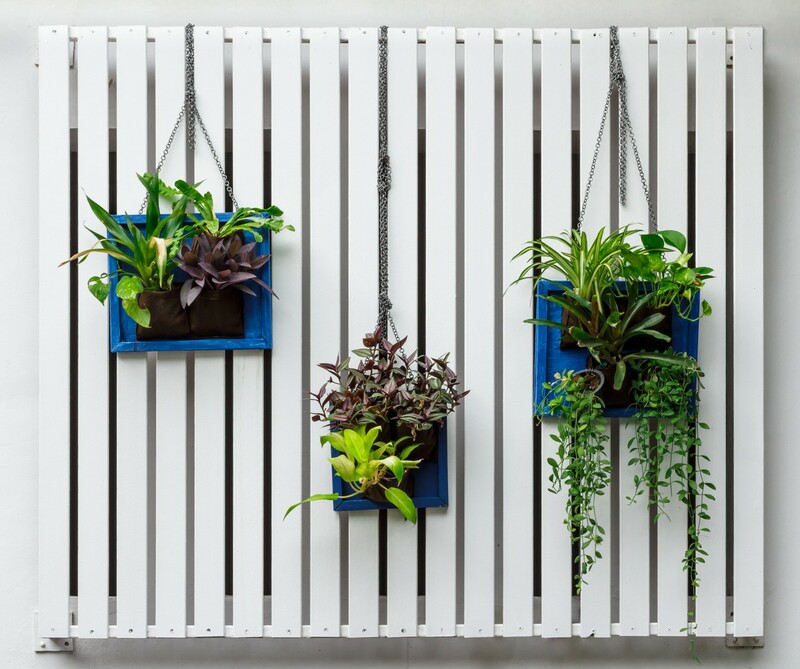 Vertical gardens have been gaining in popularity recently, and for good reason – they allow you to take advantage of unused space while adding greenery to your décor. While setup may seem daunting, plenty of how-to guides break the process down step-by-step. Many of these tutorials use common household products such as crates, clotheslines and plastic bottles, eliminating the need to splurge for a DIY. Get creative with setup – some gardeners mount planter jars to walls or even hang them from the ceiling. It’s your garden; let your personality show! In addition to saving space and being aesthetically pleasing, there are some strategic advantages to growing plants up off the ground. Raised containers and beds are easy to drain, which prevents plant rot or mold (yuck). Having plants higher off the ground also makes it physically easier for you to provide water and care, since you don’t have to hunch over as often. Win-win! After a few months, you should have thriving greenery that brings a little more nature to your city lifestyle. Whether you’re looking to create meals with your own home-grown veggies or simply seeking a place to relax, planting an urban garden can make your home feel like a natural, outdoor retreat!